Attention classic rock and roll buffs! The closest you’re going to get to seeing Johnny Cash, Elvis Presley, Jerry Lee Lewis, and Carl Perkins creating music history together is by watching the video below. On Thursday, the new Broadway musical Million Dollar Quartet (currently in previews, opening April 11) played a handful of numbers from the production to an invited crowd at the Nederlander Theatre. 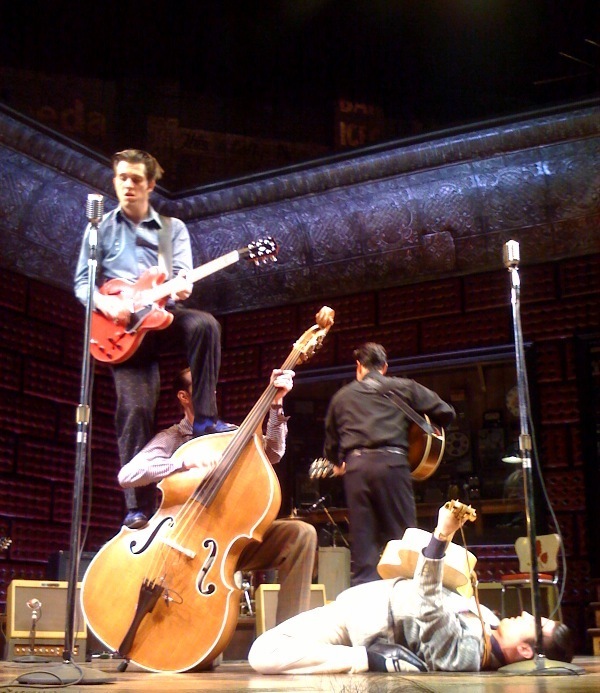 The musical spotlights the December 4, 1956 recording session at Sun Records studios, organized by Sam Phillips (Hunter Foster) that brought together Cash (Lance Guest), Lewis (Levi Kreis), Perkins (Rob Lyons), and Presley (Eddie Clendening). While the on-stage interviews seemed forced, the music flowed from these actors like whiskey in a Memphis bar. Much like John Doyle’s recent revivals of Sweeney Todd and Company, the actors in Quartet are the orchestra. These strong-voiced guys played just as well as they sang. (Lyons even stood on a bass, for wild closing-number pose!!) Oddly, Tony-award nominated musical theater actor Hunter Foster is relegated to the non-singing role of Phillips, who (from what I could tell by the preview) acts mostly as a narrator. Seems like a strange role choice for such an acclaimed actor, but I’ll reserve judgment until I actually see the full show.